RONALDO VS MESSI: A Winner At Last? | ItuaLive! 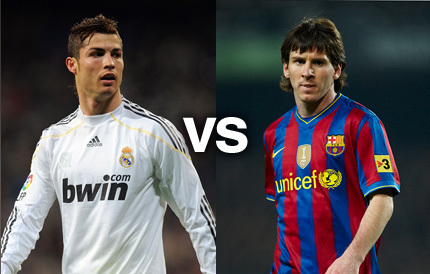 RONALDO VS MESSI: A Winner At Last? Even a toddler would have a thing or two to say about these football superstars. Christiano Ronaldo and Lionel Messi are two footballers who though still in their twenties have made legends of themselves. So who then is better? Well, this question has been trending for a while now and will continue to do so so long as these duo continue to smash records with consummate ease. The manner with which they do this is unique to both players and this makes it difficult for their passionate fans, admirers and neutrals to agree on who truly is better. Ronaldo is the embodiment of an ideal athlete: Optimal height, tremendous burst of speed and power with fantastic skills to boot. He is lethal with his head and can strike with both feet. He can nick one from a distance and he could be a fox in the 6yard box and not to forget, he is also a dead-ball specialist. It is no wonder his stats for Los blancos are phenomenal. Presently, Ronaldo is averaging just over a goal per game. You would think we have a winner, right? Well, wait to you hear what his counterpart has on display. Messi, while not exactly imposing in any physical attribute takes close ball control and dribbling at top speed to a celestial high. Many neutrals have become fans of football just by watching the diminutive Argentine at his mesmerizing best. Not since the days of Maradonna have we seen a player that consistently shows us how to dribble from any position on the field. Irrespective of the size and number of his markers, Messi glides past them like hot knife through butter. There is probably no better finisher of the round leather game on earth. Messi also scores with his head, and can score from distance. He brings such finesse to his finishing, making the most daunting task look ridiculously easy. Asides their incredible football talent, the mere fact that they are from the same era, which in itself is a rarity, is fantastic. Looking beyond their well documented physical differences, they play for teams established as eternal rivals. If comparing both players proves difficult, the rivalry between Real Madrid and Barcelona puts things into proper perspective. You cannot divorce the fact that the clubs they play for have helped stoke the fireworks. And if that didn’t do it for you, knowing that Christiano Ronaldo answers to Jose Mouriho-the special one- and Lionel Messi is managed by Pep Guardiola, a man said to be arguably one of the best coaches on the planet. The two players may be similar in how prolific they are at scoring goals but away from the pitch it’s a different ball game all together. Christiano sports Armani suits, Lionel wears Dolce and Gabbana. Christiano endorses Nike, Lionel assents to Addidas. An Audemars Piguet piece is worn around Messi’s wrist, and for Ronaldo, it’s a Time Force. Ronaldo may have won in the area of facebook fans but Messi can take solace in the fact that he makes more money. Although Ronaldo appears to have a bad boy image judging by his numerous voluptuous model girlfriends, Lionel Messi is perceived to be a lot “humbler” in his desires. Who then is the better? Well according to the World Governing Body, FIFA, and UEFA, Messi is. But if you consider that football is a team sport and to select a player above another, such a player should have exceptional talent. How well do these players fit into their respective teams vis-à-vis team work and camaraderie. And if they happen to play for different clubs, can they replicate or surpass their present achievements? Messi supporters would allude to the fact that, save for the Argentine national team, Messi has led the various teams he has played with (to lift trophies. Quick pointers would be the World Youth Championship (FIFA U-20) in 2005 cup where he bettered our own Mikel Obi as the most valuable player of that competition. They would claim that it would be a matter of time for him to replicate his achievements for the South American giants. With the consistency with which Messi raises the bar of excellence every season, few would be brave enough to bet against the La Albiceleste in Brazil come 2014. While Christiano Ronaldo’s protagonists may not mention that he has not achieved anything fantastic for his national side, they would be quick to point that he has always been exceptional at all his clubs- from Lisbon to Manchester United and now Real Madrid. Ronaldo has distinguished himself in different teams and leagues. We can’t say the same for Messi. This strengthens the claim that Ronaldo is better. Ronaldo might have a selfishness to his game, but that only adds to the allure that surrounds him. Messi almost always comes out tops each time they go head to head. And many have questioned Ronaldo’s incapability to consistently bring it on in the big games. Messi currently leads in most stats of comparison but that is not enough to stifle the pro Ronaldo camp. With Ronaldo thrumping Messi in La Liga so far, and a potential classico UEFA Champions League Final looming, there are numerous twists and turns and opportunities for these gladiators to state their claim as the best in their era. What is certain however is that this battle is not in its twilight and we should all consider it a privilege to have not one but two great legends of the game in our time.